Household income is a measure often used by planners and economists. It consists of the combined incomes of all people sharing a particular household or place of residence. Low levels of household income or household poverty is an item often used to depict where households are that have a low standard of living and which are subsequently most in need of services and assistance (such as grants, subsidised transport, etc.). How has this changed across the country? This item provides a comparison between poor households in 1996 and 2011. This provides an example of looking at the change of poor households within different settlement types (using the SACN/CSIR Typology). The ultimate aim is to target areas where poverty has increased as this often implies a need for services and infrastructure. 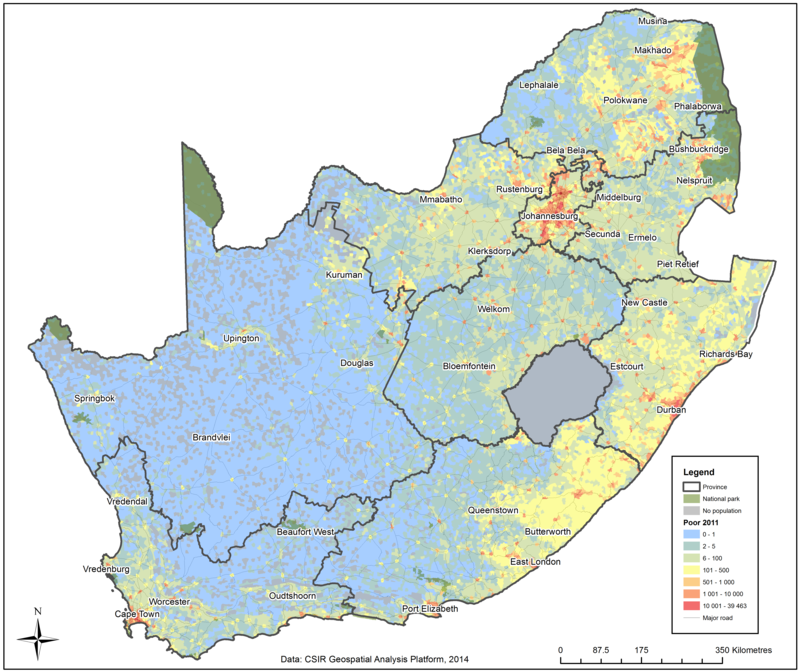 When considering changes in poverty over time it is noticeable (see map above) that households in poverty have decreased within the previous homeland areas whilst it has increased within metropolitan areas such as Gauteng, eThekwini and Cape Town. The urbanisation of poverty has often been blamed on rural poverty pushing people to migrate, but even as rural poverty has declined, urbanisation has continued and urban poverty has increased. Rural poverty has generally declined and the number of rural households living in poverty is far lower than urban households living in poverty. In this instance household income is used as an indicator of the general economic welfare of South African citizens and how it has changed over the last 15 years. The household income data is used to calculate a poverty indicator. In a recently completed report on household income and expenditure patterns in South Africa for the year 2011 a classification on income levels per household was developed by the Bureau of Market Research at Unisa (2013). • Affluent (R1 329 845+ income per annum). The definition of ‘poor’ cannot be directly extracted from the 2011 census income categories and these had to be adapted in order to calculate the total number of households within the Poor range. The 1996 census data’s first category is R0 to R24 000 per household per year. To calculate the relative 2011 income category for comparative purposes, the consumer price index from 1996 to 2011 was used to inflate R24 000 (1996) to establish the equivalent cut off of this group in 2011. After the number of households in the Poor category was established for the 1996 and 2011 census years, the proportional amount of Poor households to the total number of households per settlement type was calculated (Beukes, et al., 2014; Van Huyssteen, et al., 2014). Beukes, A., Maritz, J., van Niekerk, W., Mans, G., van Huyssteen, E., & Green, C. (2014). A Comparative Analysis of City Regions. Unpublished PG research report. Pretoria: CSIR. Van Huyssteen, E., Mans, G., Maritz, J., van Niekerk, W., Le Roux, A., Green, C., et al. (2014). 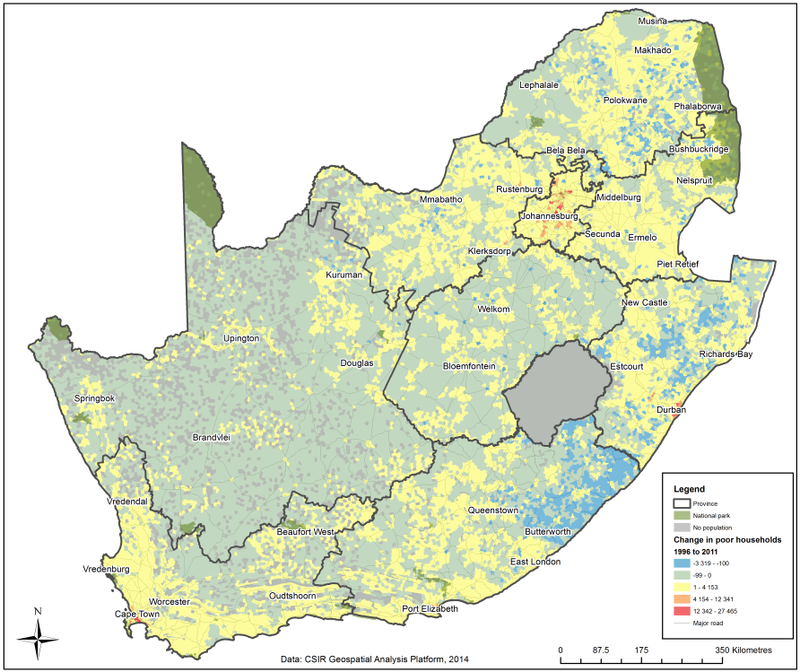 Regional and temporal dynamics of South African cities and towns. Unpublished PG research report. Pretoria: CSIR.